Eight months after being vandalized, a new statue of Col. William Crawford was placed in its home at the Crawford County Courthouse on Thursday morning. The granite statue, which replaced the original limestone statue that was decapitated in August, was placed by Longstreth Memorials and Byrd Vault Company. Photo courtesy Crawford County Now Eight months after being vandalized, a new statue of Col. William Crawford was placed in its home at the Crawford County Courthouse on Thursday morning. The granite statue, which replaced the original limestone statue that was decapitated in August, was placed by Longstreth Memorials and Byrd Vault Company. 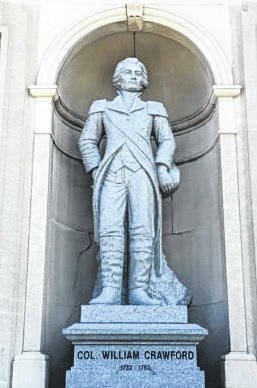 https://www.galioninquirer.com/wp-content/uploads/sites/38/2018/05/web1_Colonel-Crawford-statue.jpgPhoto courtesy Crawford County Now Eight months after being vandalized, a new statue of Col. William Crawford was placed in its home at the Crawford County Courthouse on Thursday morning. The granite statue, which replaced the original limestone statue that was decapitated in August, was placed by Longstreth Memorials and Byrd Vault Company.